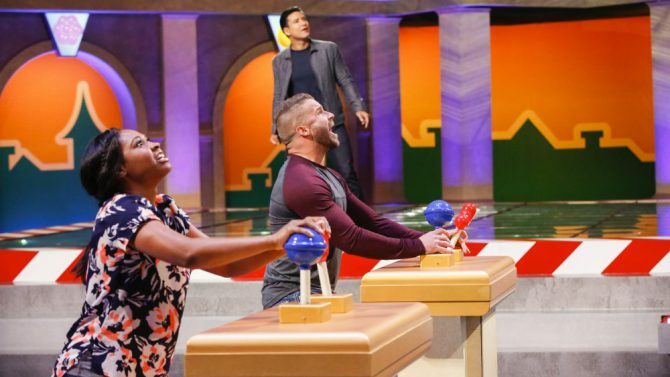 CBS’ live game show version of “Candy Crush” suffered another large drop in the Sunday overnight ratings in its third week, according to Nielsen data. Airing at 9 p.m., the show averaged a 0.5 rating in adults 18-49 and 2.4 million viewers, down approximately 38% in the key demo and 17% in total viewers compared to last week (0.8, 2.9 million). It also shed the vast majority of its lead in from “Big Brother” (1.8, 6.1 million) at 8. CBS aired only repeats for the rest of primetime. On ABC, “Celebrity Family Feud” (1.1, 6.1 million) was even, as was “Steve Harvey’s Funderdome” (0.8, 4.3 million) and “The $100,000 Pyramid” (0.8, 4.3 million). Fox aired mostly repeats except for “American Grit” (0.4, 1.1 million), which was up in total viewers. NBC’s overnight numbers are currently not totally accurate, given the extended overrun of the NASCAR Brickyard 400. Due to the overrun of the race, “Sunday Night with Megyn Kelly” did not air until 9, but is currently averaging a 0.5 and 2.7 million viewers. “Spartan: Ultimate Team Challenge” aired from 10-12, but data is only available for the 10-11 timeslot. As such, the first half of the show is currently averaging a 0.5 and 1.9 million viewers. CBS won the night in the demo with a 0.9 but finished second in total viewers with 4.75 million. ABC and NBC tied for second in the demo with a 0.8, but ABC first in viewers with 4.8 million. NBC was third in total viewers with 4.1 million. Fox finished fourth with a 0.4 and 1.1 million.